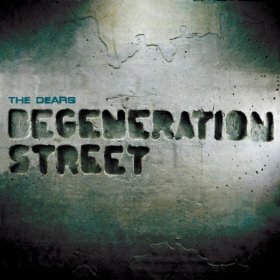 The Dears Degeneration Street is an early front-runner for album of the year. The album combines stunning layers of sound, power, and mixed 1980’s almost-jazz vibes to create an album that you still won’t get – even after a few spins. Tracks like “Omega Dog” have a fabulous falsetto, coupled with the perfect ’80s feel. It’s a bit like something from Under The Influence of Giants, but better. “Thrones” also has a bit of an older feeling, but that feels right at home in the center of this album. Loud, but never too loud, the track also hones a little bit of the Smiths. Lyrics like “not a single one of us with the guts to bear” over and over again really hit hard with the listener. I felt like I was being accosted with lyrics in this radio-friendly tune. “Blood” is a bit singsong-y, but it’s simply the type of song you’ll have in your head all week. “Lamentation” is slow and airy with just enough room for the listener to put themselves into the heart of the track. All in all, the album is one of the more solid pieces of indie rock you can pick up right now. Most tracks are standouts that will find their way onto mixtapes year after year. So do yourself a favor, and grab this album now – before someone makes you feel lame for not hearing it already.